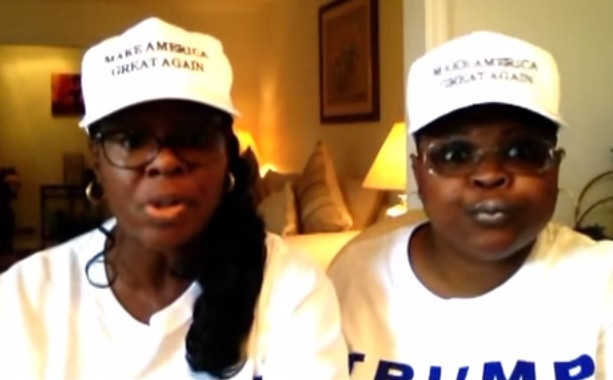 Vocal Trump supporters, Lynette “Diamond” Hardaway and Rochelle “Silk” Richardson, better known as the “Stump-for-Trump Girls,” have become a YouTube sensation with their hilarious rants and staunch support for Donald Trump. The ladies have a YouTube Channel devoted to Donald Trump for President. Today Diamond and Silk put their money where their mouth is and went to the board of elections and changed political parties from Democrat to Republican. They posted the entire video to document their trip to the elections board. They even included a catchy “Stump for Trump” rap playing in the background for effect. The two Trump supporters also encouraged others to switch parties to see Trump win. These two must terrify the Democrats.